The wind quintet has a long-time tradition and it has been existing almost since the formation of the Moravian Philharmonic Orchestra in 1945. During that time, the ensemble has had many outstanding musicians and the current members are endeavouring to continue the artistic legacy of previous generations. In recent years, there has been a generation change and significant rejuvenation. The present cast of the ensemble first appeared in 2014, when the quintet also began to use the name MORAVIA QUINTET. 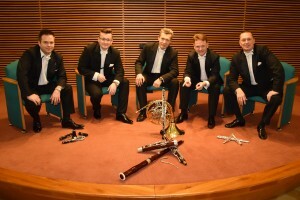 MORAVIA QUINTET Wind Quintet is currently among the leaders in its field in the Czech Republic. All its members are soloists and exceptional players in the Moravian Philharmonic Orchestra Olomouc. They participate in recording for radio and television as well as recording albums. With the orchestra MFO, they have attended numerous concert tours in Germany, the Netherlands, France, Spain, Switzerland, Austria, Ireland, Italy, Cyprus, Hong Kong, China and Japan. Most of the players are also respected teachers at conservatories and music schools. You can listen to the ensemble MORAVIA QUINTET at festivals, social events as well as concerts for children and youth.